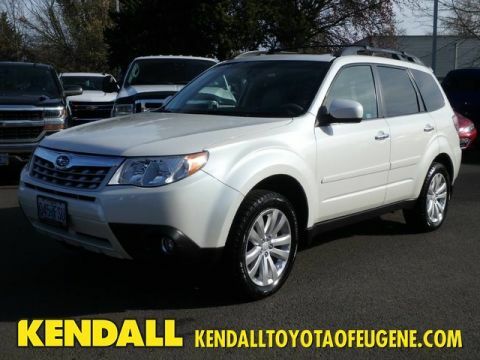 Kendall Toyota used car center is pleased to offer This Subaru Forester 2.5i Premium is an incredibly versatile vehicle that is a must have for any family. The greater your fuel-efficiency, the less your carbon footprint. And with exceptional MPGs, this Subaru Forester treads ever so lightly on Mother Earth. Savor the satisfaction of safety in any condition with this AWD Subaru Forester. Superior acceleration, unmatched traction and stability as well as a luxurious interior round out the impressive features of this AWD Subaru Forester. More information about the 2014 Subaru Forester: The Subaru Forester has always been a very nice compromise between the practicality of a small hatchback or station wagon and the capabilities of an SUV. Though it can't off-road like some of the more serious SUVs out there, the Forester does at least come standard with all-wheel-drive, unlike most of its competition. Though base model Foresters perform similarly to competitors from Ford and Mazda, turbocharged versions offers significantly more power, resulting in sprightly performance. On-road handling is also a step above what is generally offered in this segment. The Forester starts at just under $22,000. Strengths of this model include All-wheel-drive, practical, good mix of fuel efficiency and performance, good ground clearance, improved interior space Located next to the foot bridge on Good Pasture Island Road, come see us at Kendall Toyota Used Car Center.